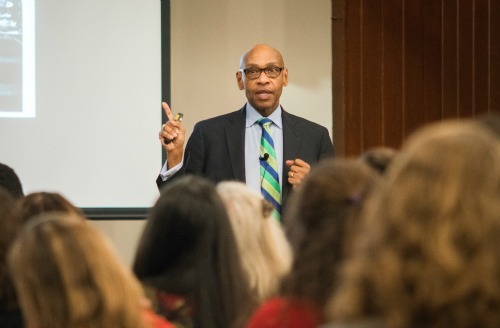 Charlottesville, Va., Jan. 20, 2016 – Dr. Gene Batiste, noted consultant on the topics of diversity and inclusion, returned to St. Anne's-Belfield School for his second visit on January 18 and 19. During this return trip the local community, parents, faculty, staff, and administrators, and current students were able to join in discussions regarding Courageous Conversations about Race and Ethnicity in Independent Schools. "Diversity is morally important for the academic and social success of all students," Batiste said at a public discussion at the Jefferson School African American Heritage Center on Martin Luther King, Jr. Day. Dr. Batiste has worked for more than 20 years in the areas of engagement, diversity and inclusion, leadership, and organizational development in independent schools. In addition to teaching and administrating, he has also served as a vice president of the National Association of Independent Schools (NAIS), and as a consultant working with individual independent schools and regional associations of independent schools. During his 90-minute presentation, participants representing area private schools, institutions of higher education, community organizations, and the School community engaged in activities and exercises, listened to information about busting myths of diversity, the mission-driven rationale for diversity and inclusion in independent schools, and more. Many also asked questions related to practical aspects of carrying out diversity work in their schools. "Diversity is a broad concept that includes many identifiers ... It's about everyone in this room because you all have multiple identifiers that are part of you," he told the crowd. The next day Dr. Batiste had similar conversations with Upper School and eighth grade students, and delivered his first homily in a special Martin Luther King, Jr. Day Chapel for third through seventh grade students. After Learning Village students Eleanor Powers and Charles Billings read excerpts of Nelson Mandela's Long Walk to Freedom and Martin Luther King, Jr.'s 1964 Nobel Peace Prize speech, respectively, Dr. Batiste spoke with students about whether Dr. King was a celebrity or a hero. "I believe that Dr. King was a hero because of three characteristics: sense of purpose, creativity, and courage," Batiste told students, before reminding them that heroes and heroines like Dr. King paved the way for our lives today. Dr. Batiste ended his visit to St. Anne's-Belfield School by joining in small group discussions with Upper School student leaders including class presidents, prefects, members of the Honor Council, and athletic team captains.